So the comment came to me the other day. Typically, I've been saying this about myself, so to hear someone else say it was a bit of a wake up. I'm a flagship snob. Things have to be shiny new in order to keep my attention. It's like the new puppy. Once its a dog I may not take it out for as many walks. I think that's a bit harsh, but I do like shiny new toys. I don't think I like it less after some time passes; but it's more likely that something newer comes along. So, when something's been in my possession for any length of time, it's a good sign that it's got some good staying power. One item that's been able to sustain my 'awe' has been Chromebook. When I first got it, I was overjoyed. Excited. Now that the sheen has come off a little, how has it held up. Performance wise this thing is a tank! It's still powering through many of the web apps (and anything should really) but even some of the Android apps work flawlessly with it. Which brings me to my most favouritest feature, the fact that it runs Android. Were it just another laptop, I probably could have easily lost interest. But, it's got all my Android ecosystem built in with a strong strong tie to my Google account, it makes what I do on a daily basis that much easier. There is one snag I noticed as you go along with it. The Android portion of the storage is separate from the Chromebook portion. What I mean is that if I open up an app, say a camera app like VSCO etc... and take a photo with the camera, it'll save the picture to a folder in the drive. In the Chromebook folder app I can see that photo. But, I can't delete it. It was kinda scary at first. I could only delete it from the Android side (I had to go into the app and delete the photo from there). I didn't try it the other way around. I noticed this with a blog site I read. They have an app and I sometimes used that. In the articles you could directly download a PDF of the sheet music. When out of the app I could see the PDF, and open it, but if I was done with it I couldn't delete it without going into Android side of things. I'm sure that as time goes by that will be fixed. I was worried that when the 'heftier model' (the i7 variant) came out I'd be dying to get my hands on that. But, I'm not even thinking that. How can anything be faster? On to some of the issues that I had found going on and from the initial review. First up is the sleeve. I didn't like it at first. But a few months later I love it. It doesn't take much to flex it to open the mouth and put the laptop in without any pinching. The Pixelbook Pen is another matter. It just sits there on the sleeve and is awkward to get out, so I've barely used it. Now my minimal usage could be from the fact that I've not really found THE use case scenario to want to take it out. It's the same with any of the Galaxy Notes. I WANT the pen, but I barely use it. 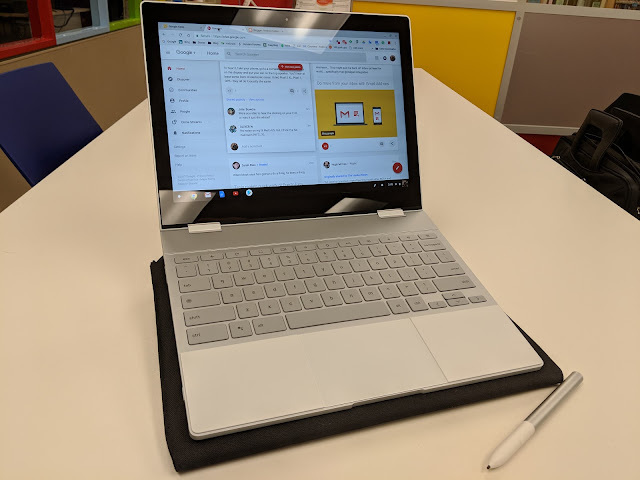 I've also had a couple issues where the pen wasn't connecting and took some figuring out reset the Chromebook (I've been learning the term 'powerwash' ... I can't remember the term for resetting the hardware but keeping the software). I've also had to do that sometimes when the audio stopped working). It's never been a big issue just took some digging to figure out what I had to do. Another item I found to be a bit wonky was the option to use the Pixel 2 as my smart unlock device. It seemed to work great, but if I hadn't used it in a while it didn't seem to want to work again and had to go through all the set up again. I think it's still not working as flawlessly as it did once, so I've just left Bluetooth off. I'm still getting used to the keyboard shortcuts (like Search+backspace to DELETE) etc... but it's not a pain anymore. The only major annoyance with this is the same I've had with the Pixel 2. The use of the PowerDelivery charging. Now, it's a laptop, so I have to remember that. The fact that my son's Chromebook has a very unique/proprietary plug would be an absolute headache. The fact that this charges via something USB at all is a godsend. It was nice going on conference trips and if I needed a little more juice, I could pull out a 6000mAh battery and cable to keep it going. But, still, if the source isn't PD, the charging is SUPER SLOW. And it may not be SUPER SLOW, it could be that it's a huge battery, and that I'm used to QC3.0 charging that anything less is a pain. In the end... LOVE IT. I can't imagine not recommending this to everybody. Heck, I even bought my kid a Chromebook after using this. I wasn't about to get a 10 year old a Pixelbook... maybe later tho'.